Use it at the discretion for frying, baking. For cold: desserts and care. Cosmetically use it directly on the skin. Coconut oil is a perfect addition for so called “bulletproof”. It is a coffee with an addition of coconut oil or clarified butter, which not only provides a great amount of energy but also can facilitate the processes which lead to ketone bodies production in people on ketogenic diet. It can be used instead of breakfast or just before training. You should start preparing the bulletproof coffee from maximum ½ of teaspoon of coconut oil, and then step by step increase the dose, because too large amount at once may cause diarrhoea. Adults are recommended to use about 3–4 tablespoons of coconut oil a day, preferably with a meal, as then its absorption will be the most effective. As already mentioned, you should start from the smallest dose, and if it will be well-tolerated by your body system, you can gradually increase the dose. Coconut oil can be used as a hair mask for moisturizing and strengthening its structure. You should only put it on dry hair, leave for an hour and then wash with a shampoo. Coconut oil can be applied on skin, wounds, abrasions, inflammations or you can use it for removing make-up. Coconut oil is oxidative stable, so you don’t have to store it in a fridge. It is enough to store it in cool, shady place to keep its properties for a long time. 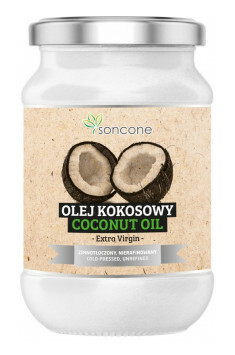 Coconut oil can be also used for frying, unless the heat treatment temperature does not exceed the oil smoke point (175°C), or as a butter and margarine substitute.